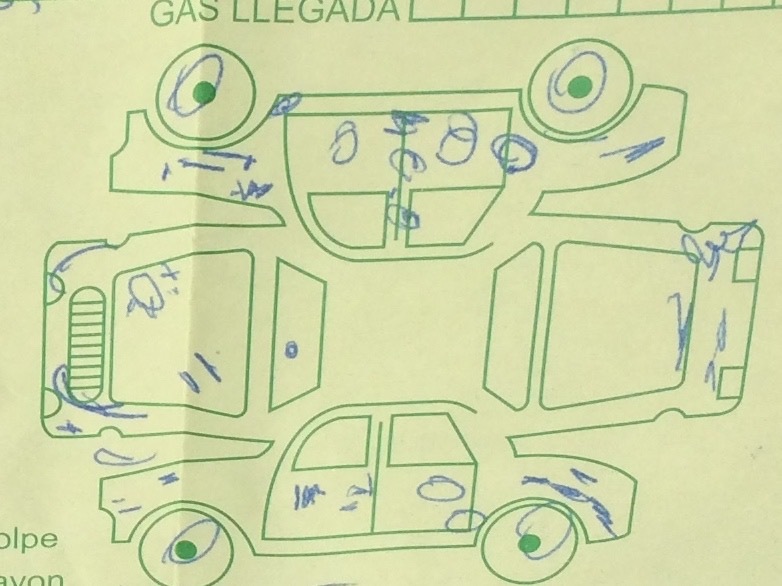 For our trip to La Guajira, we decided to rent a car. We were thinking about visiting Cabo de la Vela, which, according to all accounts, was wiser to do in your own car. Sixt, my favorite car rental company, is not present in Colombia. We had the great experience renting cars from them all over the Europe, from Spain to Bulgaria. Regardless of location, the service was efficient, the prices were fair and the cars were in great shape. To my surprise, there were just two car rental companies available in Santa Marta Airport: Hertz and National. Hertz’s online quote was almost twice as expensive in comparison to National’s for the same type of car. Alas, we made a reservation with the latter. During booking process, the reservation UI was in English. Email confirming the reservation was in English too. However, a couple days before our trip, we got a message from Santa Marta’s National local office asking to confirm the reservation and provide flight information. This time it was in Spanish. Lo and behold, we landed at Simon Bolivar Airport. The proposed expansion hasn’t happened yet, so it is still just a small town airport where you can not get lost. The National Car Rental counter was suspiciously dusty. In all fairness, the neighboring Hertz counter also looked as if the last person they served would be retired by now. A smiling gentleman wearing shirt with National logo popped up seemingly out of thin air. Oops, he spoke Spanish only. Not only Spanish, but Caribbean variety of it. From now on, all forms and papers related to our rental agreement were in Spanish. Granted, there were just a few of them. Frankly, the gentleman was interested in getting AT’s signature on credit card stubs only. My feeble attempt to get a filled and printed copy on the rental agreement was met with a smile and an offer to go to the office somewhere in Santa Marta (we did not have a clue where), and talk to the manager there. Obviously, spending a better half of the first day of our 4-day trip looking for this elusive office, talking to the manager, etc… was the last thing we wanted to do. Hence, against our better judgement, we found ourselves on the way to our car with a rental agreement, that besides the National logo at the top had only our address. Finally, we were in front of our car. My first thought was that we were not going to go anywhere simply because that car could not move. All 4 hubcaps were bad, with one of them precariously hanging on one screw without any intention of being attached to the wheel. The amount of dents and scratches was astonishing. I think the rental guy just simply marked all possible surfaces. Remarkably, with the turn of the key the car came alive. Frankly, if there were a slight chance to get another car before we left the parking lot, I would do it in a heartbeat. Conveniently, it was the only one. My hat’s off to you, Santa Marta’s National Car Rental office for being so savvy in human psychology. You know that your customers would be eager to leave for a long-awaited vacation and the prospect of driving into the city to the main office and sorting out car issues would not be appealing choice for spending an afternoon. In the long run, this car served us amazingly well. It never failed to start. 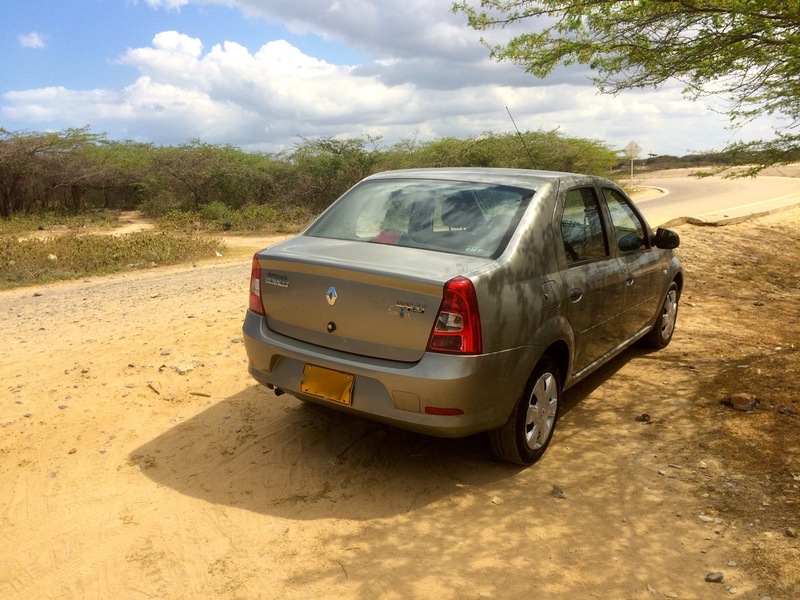 It was surprisingly resilient on less-than-perfect unpaved roads of La Guajira. And the best thing? It blended so well among other equally beaten-up local cars that nobody looked twice at it or thought about breaking into it. However, we skip the trip to Cabo de la Vela: somehow, the idea of been stranded in the middle of the desert due to the car failure was not really appealing. In hindsight, it was the worst car rental experience so far, but it gave us the freedom of movement and ability to visit places not accessible otherwise. There is no free lunch, after all.